Brian Nichols, left, U.S. ambassador to Zimbabwe, is interviewed by VOA Zimbabwe Service's Marvelous Mhlanga-Nyahuye in Washington, Sept. 14, 2018. 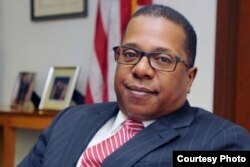 The newly appointed United States Ambassador to Zimbabwe, Brian Nichols, says that Zimbabwe must follow through on promised reforms if it wants U.S. sanctions on the country to be lifted. In an interview Friday at the Voice of America’s Washington headquarters, the diplomat told VOA’s Zimbabwe Service that the newly elected administration of President Emmerson Mnangagwa will get the U.S. government's full support if it implements legal changes it promised during the election campaign. Nichols said those reforms include observing the rule of law and allowing citizens such freedoms as access to information and free speech. Last month, U.S. President Donald Trump renewed sanctions against Zimbabwe and set out steps the country needed to take to have them removed. The presidential act, called the Zimbabwe Democracy and Economic Recovery Amendment Act of 2018, also known as Zidera, set one such condition as ensuring that July’s national elections were free and fair. Following those elections, the ruling ZANU-PF was declared the winner, but the opposition challenged the results, claiming fraud. The Constitutional Court in August ruled against the opposition’s claims of election rigging. The election, which many said was peaceful compared to previous elections, was not free of violence. The army reportedly used live ammunition and killed at least six people during opposition protests of the vote. Nichols said he has met both Mnangagwa and opposition leader Nelson Chamisa and looks forward to working with both men. “I think they are both people who love their country and are committed to improving Zimbabwe and changing many of the problems of the past,” he said. FILE - Priscilla Chigumba, right, head of Zimbabwe Electoral Commission, talks with President Emmerson Mnangagwa in Harare, Aug. 26, 2018. Mnangagwa has called for the lifting of U.S. sanctions against officials from the ZANU-PF ruling party, top military figures and some government-owned firms, which were imposed during former President Robert Mugabe’s rule for election rigging and human rights abuses. Zimbabwe’s Foreign Minister Sibusiso Moyo has said Mnangagwa’s government was shocked by the renewal of U.S. sanctions. Nicholas emphasized that the United States has targeted sanctions on only some individuals and entities in Zimbabwe, but not the entire country, and that U.S. businesses are not restricted from investing or doing business in Zimbabwe. He said that businesses want to invest in Zimbabwe, but also that investors want to see the implementation of reforms talked about by government officials. “Decisions on investment in Zimbabwe are driven by the economic conditions in Zimbabwe, the rule of law, the assurances that people’s investments will be protected, that they have the right to have majority ownership in their businesses,” he said. Nichols says he believes Zimbabwe has much economic potential, especially in tourism, agriculture and mining sectors. “Zimbabwe is one of the most beautiful countries in the world. … Zimbabwe should be capturing more tourists and providing them with a world-class experience,” he said. In terms of agriculture, Nichols said he hopes reforms discussed by both candidates during the presidential campaign will be implemented to help build a more “resilient and successful” agricultural sector. Zimbabwe’s agricultural output plummeted under Mugabe, who seized white-owned farmland beginning in 2000 and gave it to blacks with little experience in large-scale farming. “And then obviously the extractive industry sector, mining, is one where Zimbabwe has tremendous potential — 40 different valuable minerals in Zimbabwe — that I think, if properly managed, could provide tremendous, tremendous opportunities,” Nichols said. ​Nichols also announced an initiative in which the United States would help Zimbabwe fight a cholera epidemic. He said the United States was working to provide Zimbabweans with more than 300,000 vaccinations that can help prevent cholera or speed recovery from its infection. Read the full transcript of the interview with Ambassador Nichols on VOA Zimbabwe Service's website.